You are here: Home / Hatch Magazine / Tenkara Mouse! Fish with a tenkara rod long enough and you will start looking for ways to push the envelope. It is the nature of fishing and anglers, but especially that of fly fishers. As Mossy Creek Fly Fishing’s tenkara guide, the notion of catching one of our spring creek browns or rainbows using a mouse pattern and a tenkara rod has always intrigued me. Last summer, we dabbled around with it and you only need to see the award-winning film Blood Knot to see the result (Spoiler alert: Brian Trow catches and lands a 19” brown trout with a mouse on a tenkara rod. It is one of the more exciting “eats” in a film chock full of exciting eats). The Mossy Creek Fly Fishing guides gather two or three Friday evenings a month to down a few PBRs, try out some new flies or just put a challenge on each other. We call it “Fishing Friday.” It is invitation only and very ad hoc. For a tenkara mousing rod, I like the Tenkara USA Ito. As a “zoom rod” — going from 13 feet to 14 feet 6 inches — it has the reach needed to get up and over the weed beds in the water and the tall grass along the banks of spring creeks like Mossy and Beaver here in the Valley. It also has the backbone to cast a big fly and land big fish. In order to turn over the wind resistant mouse pattern, I use a 14 or 16 foot light floating line that we customize here at the shop. I like the ability to “anchor” a small portion of the line on the water during the presentation and also to “steer” the mouse a bit with the line. I go short and heavy on the leader/tippet combination, running about three to four feet of 3x from the end of the fly line. Many folks think that nighttime is the right time for mousing and I won’t disagree, but on a very recent guiding gig we had a frenzy of activity at 3:30 PM, in bright sunlight. Brian caught the brown mentioned above in the early afternoon on a bright July day last year. First, you have to think like a mouse. Look at your surroundings, take note of where you are fishing and think about how and where a field mouse could get in trouble and wind up in the water. That is where you want to aim your cast. Next, think about what happens when they hit the water. Mice and other small rodents are not designed to swim and it shows in the water. Think about a dog in the water, they are mostly underwater, with just their back and head above the surface. Same with the mouse, mostly just its head is above the water. They have spurts of activity then tire and dead drift. Mice are not going swim long distances or for long periods of time. All these details factor into your presentation. When you can, make a quartering upstream cast. You aren’t going for a delicate presentation here, you want a splash close to the bank. Mice don’t just fall from the sky like spinners. Make the cast, let the mouse pop to the surface (if it doesn’t get eaten when it hits) and then twitch it a bit. Don’t go wild with the twitches. Try and let it drift near the bank if the current runs that way. If the current moves it toward the middle, then start fishing it like a surface streamer. Short quick twitches followed by a dead drift seem to work well. When the mouse swings around and heads up stream, unless you are in an eddy or really slow moving water, you can start to recast — mice don’t swim upstream to well. On a recent tenkara mousing excursion, after a few good presentations the fish were simply ignoring our offerings. We knew the fish were there, because we could see them. They weren’t spooked and we watched them take a nymph now and then. Of course we could have switched to a dry-dropper or a nymph rig, but instead I tied on a weighted nymph off the hook bend of the mouse. It didn’t take more than a couple of casts before the fish started showing interest in the mouse and the nymph and the client connected with a nice 16” rainbow. 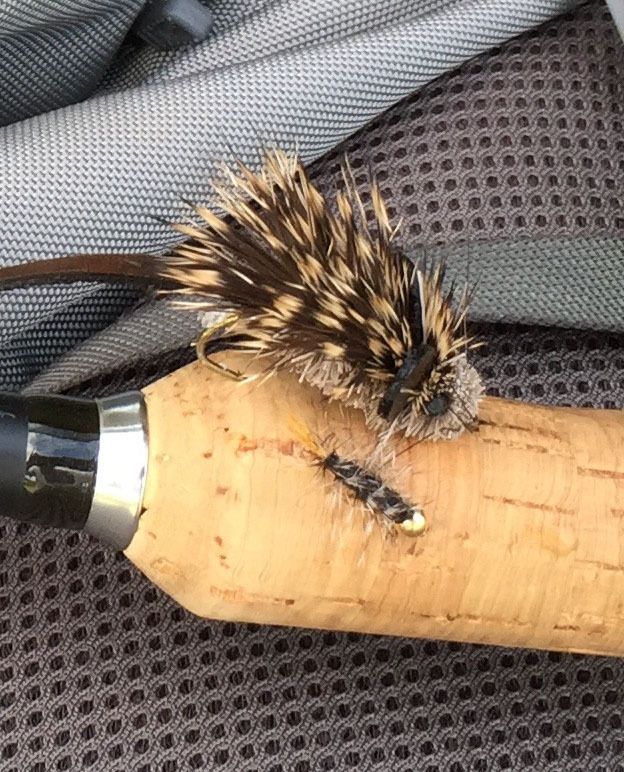 The “mouse-dropper” rig has some distinct advantages when fishing a mouse. First, the weighed nymph sinks the back end of the mouse pattern, making for a more realistic representation. Second, the nymph acts like a sea anchor and helps keep the mouse in the seam or current. Finally, and most obviously, is the fact that you have the nymph there to offer the fish if they don’t want the mouse.